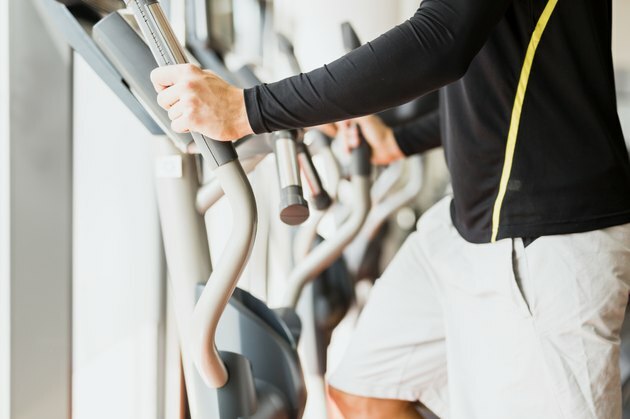 Exercise is touted as a must for individuals who are interested in losing weight, promoting good health and slowing -- or preventing -- the development of certain chronic conditions. While there is no question that the benefits of exercise are numerous, certain draw-backs do exist. In fact, the American College of Sports Medicine reports that bruises are a possible, albeit rare, side effect of certain types of physical activity. Be sure to talk with your healthcare provider if your bruises do not show signs of healing within a week. A bruise -- or contusion, as it is sometimes called -- occurs as a result of bleeding under the skin or in the surrounding tissues. Bruises are traditionally classified into one of three categories, including subcutaneous bruises, or those which occur beneath the skin; intermuscular bruises, or those which occur inside the muscle; and periosteal bruises, or those which occur on the surface of the bone. Both intermuscular and periosteal bruises may occur as a result of participation in an exercise program. When muscles are placed under stress during resistance training, they develop a series of tiny tears -- and as these tears heal, muscles become stronger and larger. While this is a normal part of any resistance training program, individuals who engage in very heavy weight lifting may actually be at risk for the development of intermuscular bruises due to the excessive stress placed on the muscle fibers. In fact, participating in very intense resistance training can cause enough trauma to the muscle fibers so as to cause small amounts of blood to be released into nearby tissue. Powerlifting and performing one-repetition maximum lifts are examples of resistance training exercises that may cause intermuscular bruises. Individuals who notice bruises after participation in aerobic exercise may be suffering from subcutaneous or periosteal bruises. While subcutaneous bruises traditionally occur as a result of trauma -- such as falling off your bike while cycling -- periosteal bruises may be a sign of a more serious injury. In fact, periosteal bruises sometimes occur as a result of stress fractures, such as those which afflict endurance runners. Periosteal bruises are not only the most painful, but also take the longest to heal, notes the University of Rochester Medical Center. While most bruises heal own their own, individuals who suffer from severe cases of intermuscular or periosteal bruises may require medical treatment. Talk with your healthcare provider if you develop a bruise after exercise that has not begun to heal after one week. If you have, in fact, developed a periosteal bruise as a result of a stress fracture, you may need medical treatment and might be encouraged to undergo surgery. Similarly, exercisers who develop intermuscular bruises may need long periods of rest and medical supervision to ensure a full recovery. What Causes Bruising When Weightlifting?